Remember my Pants on Fire shorts? (I hope you do, because I love the photos, and the story of how they got their name is pretty hilarious). I made them to take with me to a visit to my parents on their farm in Hawai’i back in 2016. They were great, but the farm is hard on clothes, and they got thrashed. Something got on the fabric, or there was something about the fabric, that got this weird bleaching everywhere. Plus there were farm stains. 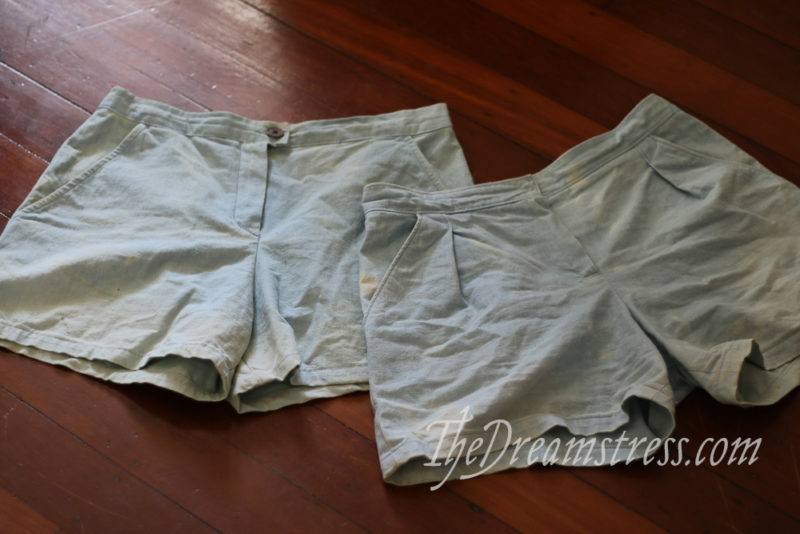 I would have just left them on the farm, to wear the next time I went home to Hawai’i, but I brought them back to Wellington, because I’d made them so quickly I just drew the pattern straight on the fabric, and forgot to keep a copy. So I took them apart back in Wellington, took patterns off of them, and then I sewed them back up. I even took the time to add a zip facing, which I hadn’t originally included, and that meant I had to lengthen the waistband, so now the shorts are a weird patchwork of fabrics on the inside! 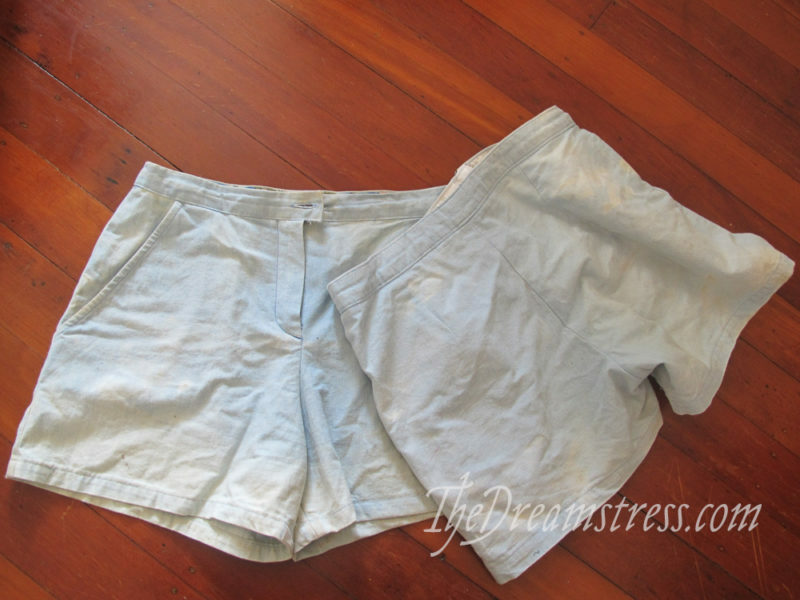 Why bother re-sewing worn, stained shorts? My mother didn’t teach me to sew, but she did teach me one important thing about sewing: always use good quality fabric. Good quality isn’t the same as expensive, but don’t waste your time on stuff that won’t last. And she & my dad also taught me another thing, even more important: reducing and re-using are the best way to care for the environment. Things should be cherished, not treated carelessly, and that function is more important than looks. The more uses you can get out of an item, the more you honour its existence and purpose. (as kids we found Dad’s insistence on taking care of things and repairing things incredibly aggravating – as an adult, I desperately wish everyone of my parent’s generation had had the same convictions – the planet would be in a much better state if their attitude was more common). 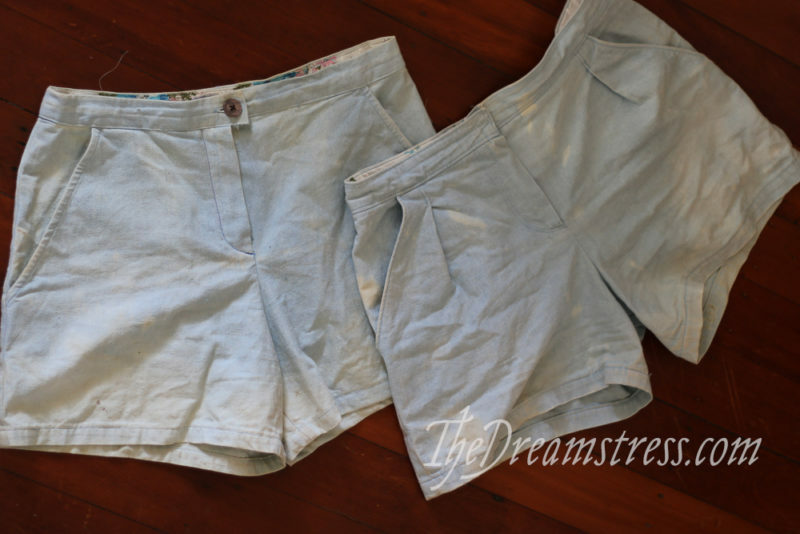 So, these shorts may be stained, but the fabric is still robust, and I can still use them for painting and farm wear and other uses – and the more wears you can get out of a garment, the better. So my shorts are back in circulation. They went back to Hawai’i with me last year, and got worn, and worn, and worn. This time they stayed there, to be used every time I’m home. The other way to reinvigorate stained/faded fabric, if the stitching and fabric are still robust, is to overdye them. That usually makes them look new again! Well done on putting them back together in such a neat way! Well I think that the mis-matched inside is adorable and cheerful. And 3-cheers about standing up for the environment, especially focusing on the “re-use” part of the “reduce, re-use, recycle” triangle. They look a bit like they were bleach dyed (deliberate technique to remove random sections of colour). I do love that you’ve remade them and the patchwork inside is something I’ve done before too; I do a lot of mending for my family to keep things going as long as I can before I have to bin them. I always seem to be darning our hand knit socks too. I’ve been thinking about this a lot lately too. 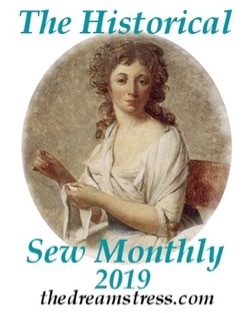 After resolving to not buy fabric this year and focus on using my stash, I’ve decided I really want to take a more 18th century approach to buying and using fabric: Buying higher quality stuff, and getting as much use out of it as I can. More piecing and patchwork linings! For the March challenge I used old wool skirt bits and linen scraps for my waistcoat, and I was so pleased to be re-using materials. I had forgotten the shorts on fire story! How foolish of the salesperson to leave a candle there! I agree that the different fabric bits make the inside look cheerful, and I hope you get many more years of use out of these shorts. Me too, and I keep coming back to see what other people say, or ideas that the commentariat on this blog have. Your resolution sounds really cool, and I bet that you are enjoying the creativity and problem-solving that goes into piecing and pattern-matching. 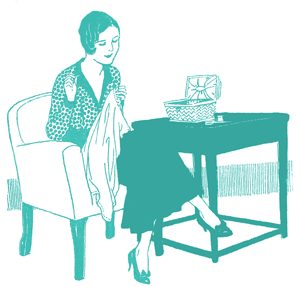 While I do not sew, I–like you–try to buy the best-quality I can afford, and then use it to bits. Children’s clothing is especially egregious; it can be so poorly made and parents are expected to buy so much of it. I am lucky that I received many hand-me-downs. I try to only buy what I need, and the best quality possible so that I can give another mom a full wardrobe at the end of the season. I am a total stan for Boden quality-wise, and I understand that the kids’ clothes are on their 5th family and doing just fine. 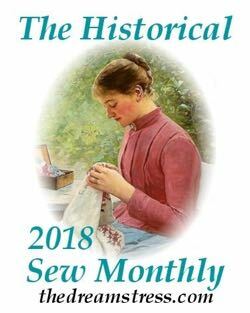 I would love to read about your piecework projects. Do you have a blog? The Guardian has long published about waste in the textile industry. This year, they also started writing about food waste, which really opened my eyes and resolved me to go back to a plant-based diet. Thank you, Vincent, and thanks to everyone in this column. How neato. Thank you! I wore a lot of hand me downs too as a child, and then they went to my 3 younger siblings. I am indeed enjoying the challenge of cutting things in the most economical way, and deciding on which stash fabrics go best with which other ones for linings and whatnot. I am by no means lacking in fabric (I have 2 big filing cabinets full, which is why I decided not to buy more fabric this year) but I still try to save on it, especially if it’s good stuff. I sometimes piece a bit on waistcoat corners just so I can make my cutting layout more efficient, which is a very 18th century thing to do. 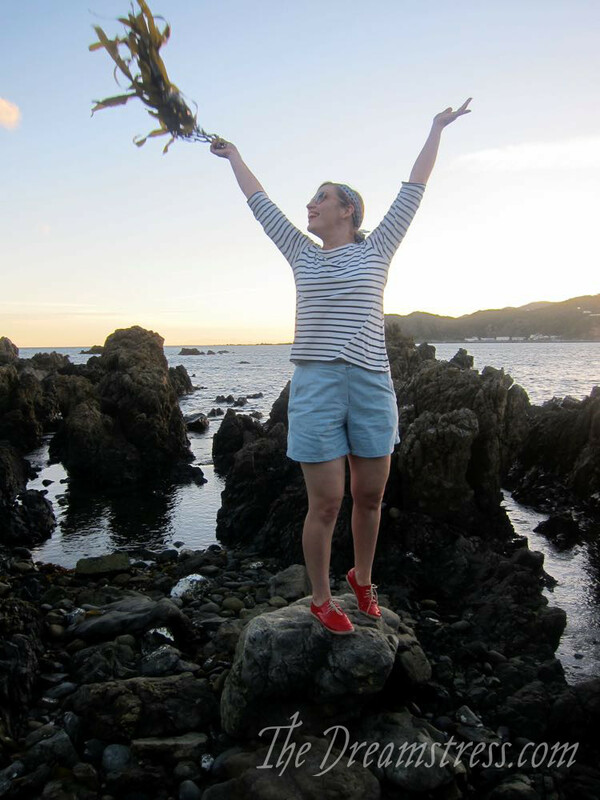 Yes, I do have a blog! If you click on my name it should link to it. Oh em gee. I love your blog and everything I have read about you. You go all-in and I just LOVE IT! Outside of this complicated subculture, I am so jealous! Fabric swaps–that would be SO MUCH FUN! I bet it is such a treat to see what is in another person’s stash along with any stories that come with it. What sort of awesome clothing-swap finds have you gotten? Ehh, haven’t really gotten much from the few clothing swaps I’ve been to. I mostly just wear historical clothes I’ve sewn myself. 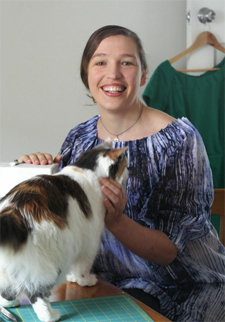 I went to the clothing swaps mainly to get rid of my old store bought clothes, and to chat with some friends there. I did get a bit of costume jewelry, a pair of cheap plain brown boots that look nice in photos but are not at all warm, and some big leather jackets to cut up to make other things with. Replying to myself so that I can reply to you! (I seems that there is a limit on “reply” buttons. That brings me to a very public apology to a very paternalistic post. But, I suppose it is important to hammer out details and logistics and intention once you make a certain decision. And language matters. Maybe it was hard to read. Sounds like you find ways to have fun at clothing swaps, and the possibilities of the leather jacket are endless (vests, twine, belts…geeze, I know so little about men’s clothing) What are you going to do with all of your finds? It is wonderful to swap unused stash stuff, and to know that it’s new and exciting stuff to someone else. The buckles were of no use to me, as they were the vintage kind that’s just a circle or oval with a bar through it (I think they go on matching belts for dresses? They’re very different from 18th century buckles anyways. ), and I think they’re much better off in the stash of someone who will use them. The big piece of lace I got in exchange will be very nice on an 18th century shirt! I have made something out of two of the fabrics I got at the fabric swap, but I fear this comments thread is getting rather long, may I suggest we continue this conversation by email? This makes me very happy. 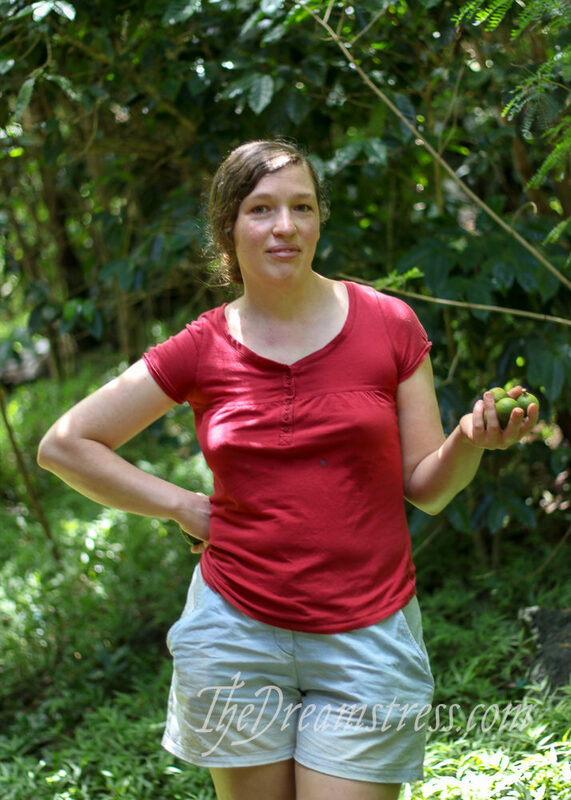 They are great shorts – very practical, with decent pockets (big enough for a whole avocado). They look comfy without being baggy. I was brought up to wear things out, too, and, as you know, have a collection of cabbage (I do thank you for that word!) from past sewing that is called into use for all kinds of things. Respect the fabric, and the work that went into making it, and, I do agree with your mother, quality and price are not the same thing. I also like your additions of extra fabrics. My mother believed that if you had to fix something, make a patch, or whatever, you should make it beautiful, and make it look as if it was meant. I love this sustainable philosophy and hope I can move closer to it in my own life (not there yet!). Do you have any tips for identifying good-quality fabric? I have mostly only ever had access to big-box craft stores, and I don’t know how to tell whether fabric is good. 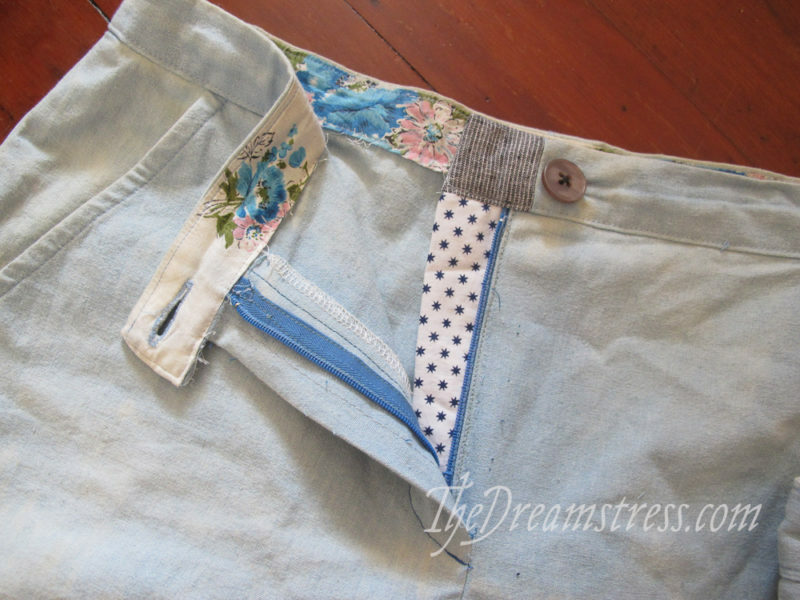 I LOVE the mismatched linings but I would have dyed the shorts a darker blue first. Good fabric is hard to find, and a good fit is worth the trouble! Those are super shorts: may they have many seasons ahead. So folks like your parents, who sound really neat, are out there. I am praying that the increasing media attention to sustainability will reach more people. Echoing others, if you might write a post on how to know if a fabric is a quality product, lots of us would be thrilled. Just had this conversation with my husband yesterday as I sewed up a pair of knickers cut from castoff tee shirts (must comfortable undies ever! ), and patched another pair with leftover fabric. It’s deeply satisfying, environmentally and economically, to get the most out of fabric. I darn socks too, for maximum lifespan. Oh, that is BRILLIANT!!! I love the idea of soft soft sheets turning into hankies. In my line of work, someone is always crying in my office, so paper is a must, but I do try to buy the most sustainable ones. But at home? I will have to steal your brilliant idea.